There are so many good reasons for not running marathons. The training for a start. A standard marathon training plan will invite the runner to build up their distance until they are running 80 to 100 miles without difficulty every week. At the slow speed that I need to run those distance, in order to avoid injury, that’s around 10 hours running every week, on top of which you can add about half the same time again in the hot baths I take (again, to avoid injury) every time I have run further than two or three miles. That’s two hours you have to find every waking day, time you lose between being with the boys when they awake, taking them to school, cooking for them, their bed time story, their coding club, their swimming or their football teams. Ten hours a week for thirteen weeks: that’s the writing of The Prime of Miss Jean Brodie, or The Remains of the Day . Then there’s the pain. So far this year, I have run indoor track races at 400, 800, 1500 and 3000 metres. At every one of those distances I could feel my speed deteriorating the longer the race went on. The last of those races, a 3000 metres on the steep blue banked-track at Lee Valley, I ran the final kilometre a full thirty seconds slower than the first k. That’s what lactic acid does, it hurts. The bounce with which you set off: it departs. Your knees, which once lifted from the track in something like a bicycle motion, shuffle. Your feet lift so heavy from the ground. Friends tells me that they survive distance races by breathing in ever deeper mouthfuls of oxygen, in their own private approximation of a woman giving birth, “Gas and air. Gas and air.” “I want an epidural now.” I’m sorry, the marathon midwife says, you’ve got four hours thirty minutes of just air and air. I’m not a long-distance runner; I weight too much. My bones are too big. Vestigial as those muscles may be, I did once have some fast-twitch muscle in my legs and its memory and its burden remains. 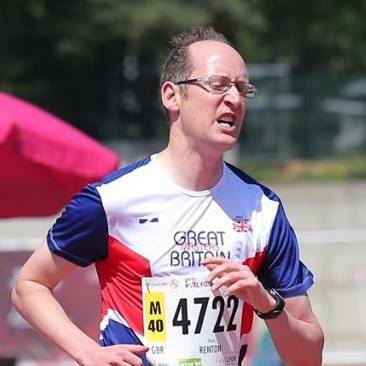 In the distance past I used this blog to sing the praises of a kind of running, middle-distance running, which suits a personality trait so deep – my preference for the sudden burst over the slow journey. I’ve run a lot since then, 100 miles a month for the last five years but never once have I managed 100 or even 80 miles a week.